Perpetual Motion, in mechanics, a machine which when set in motion would continue to move without the aid of external force and without the loss of momentum, until its parts became deranged or worn out. Although the impossibility of constructing such a machine has long been demonstrated, many attempts have been made, an interesting history of which has been given by Henry Dircks, "Per-petuum Mobile, or a History of the Search for Self-motive Power " (London, 1870). The earliest record of a contrivance for effecting mechanical perpetual motion was by Wilars de Honecourt, an architect of the 15th century, whose sketch book containing the accompanying cut, fig. 1, is in the ecole des chartes at Paris. This contains the imaginary principle upon which most of the perpetual motion machines having any plausible appearance of effecting the object have been constructed. The design will be made more apparent by fig. 2, a revival of the same plan by Capra (Bologna, 1678), in which the weights by reason of their mode of attachment take a position further from the centre of motion when descending than when ascending. It will be readily seen that this dispositon of the weights may be effected, but the result will be that of those which are on the ascending side there will be a greater number at any one time than of those on the descending side, and it may be computed that the mechanical force of the ascending will exactly balance that of the descending weights. 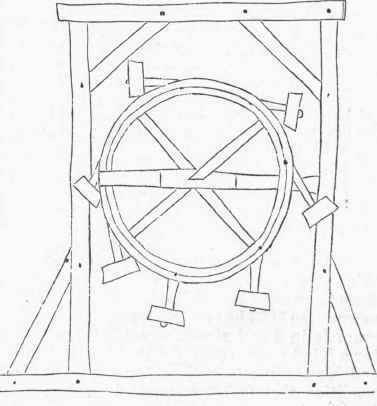 The machine of the marquis of Worcester, which has great historical prominence on account of the rank of its inventor, was a wheel ostensibly moved in a similar manner. An account of it and of the attention it commanded, as well as of the machine of Orffyreus, and also of other engines sought to be moved by water and other means, may be found in Mr. Dircks's work. Ever since the establishment of the laws of motion, about the middle of the 17th century, the impossibility of producing such a perpetual motion has been apparent to all who have mastered the principles of mechanics. Admitting the third law, that action and reaction are equal, perpetual motion can only become possible when a body once set in motion shall meet with no resistance, which is an impossible condition. If a top could be made to spin in a perfect vacuum upon a point without friction, it might never come to rest; but it could exert no external force without losing its own. 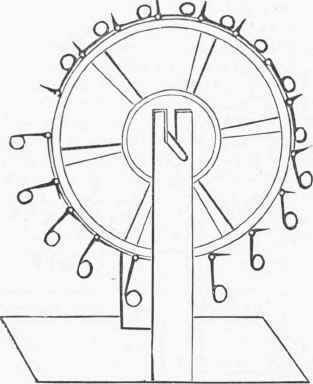 The impossibility of a perpetual motion was assumed by Stevinus in the demonstration of a principle in statics. He supposed an endless chain of balls hung over two unequal inclined planes of equal altitude, the chain forming a loop beneath the planes. It is demonstrated that the weight of the balls on each plane, multiplied into the reciprocal length of the planes, will be equal, and that therefore the forces will balance each other; but Stevinus concluded that an equilibrium would result by assuming that otherwise an absurdity, viz., a perpetual motion, could take place. Another demonstration of the impossibility of perpetual motion is the establishment of the doctrine of the conservation of forces. (See Correlation and Conservation of Forces, Heat, and Mechanics.) This doctrine was advocated by Count Rum-ford, and demonstrated by him with a considerable approach to accuracy; but the more recent investigations of Joule are regarded as more satisfactory and complete. The doctrine has also been advocated in a theoretical manner by Dr. Mayer of Heilbronn and by Professors Henry, Balfour Stewart, Maxwell, Grove, and others. But it can hardly be said that this places the matter in any clearer light than that given by the laws of motion. In either aspect a mechanical perpetual motion is clearly an absurdity. Fig. 1. - Facsimile of Sketch by Wilars de Honecourt. Fig. 2. - Capra's Machine.